Since I make pizza regularly, I am always trying to come up with new ideas for toppings to keep things interesting. I also have been trying to buy food that is local and in season. Those two concepts intersected recently to result in: the beetza. Beets are not, strictly speaking, in season since everything here is dead, but these beets were local and probably have been stored away somewhere since the fall—as seasonal as I’m going to get in January in Minnesota. To accompany the beets, I thought I’d aim for the classic combination with basil and goat cheese. I bought basil but since I already had feta so I decided to use that in place of goat cheese (I defy you to find a difference between sheep and goats). Almost all the beets I’ve ever eaten have been roasted, but I figured with 9 minutes in a 500 degree oven thin matchsticks of raw beets would be fine. As it turned out, the beets were still pretty crunchy, which I didn’t mind, but some probably would. 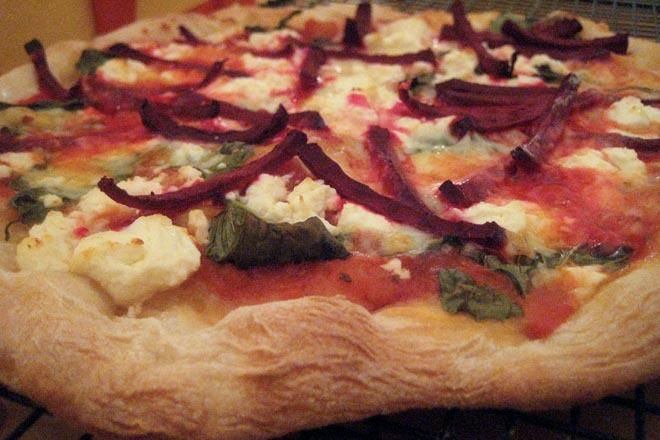 This was a good pizza, although the beet flavor wasn’t especially strong. The color of the beet juice bleeding out from the beet pieces made it very visually striking; it was probably worth it just to see that. I did not get the crust on these pizzas as dark as I usually do and I couldn’t figure out why at the time. 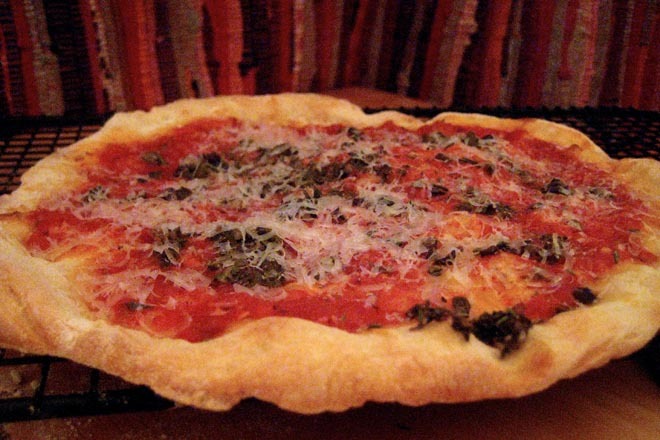 Same oven, same maximum heat, same crust (Peter Reinhart’s napoletana dough from American Pie). It was only the next day when I remembered that I had my pizza stone set up on a rack in the lowest position, rather than on the floor of the oven. Putting it on the floor gets the stone a lot hotter since the gas burns just below the floor. In fact, it gets too hot for bread, burning the crust before the inside is cooked, which is why the stone was on a rack in the first place. But for pizza, you want everything as hot as it can get, so I have to remember to move the stone. Those 2″ make a big difference! 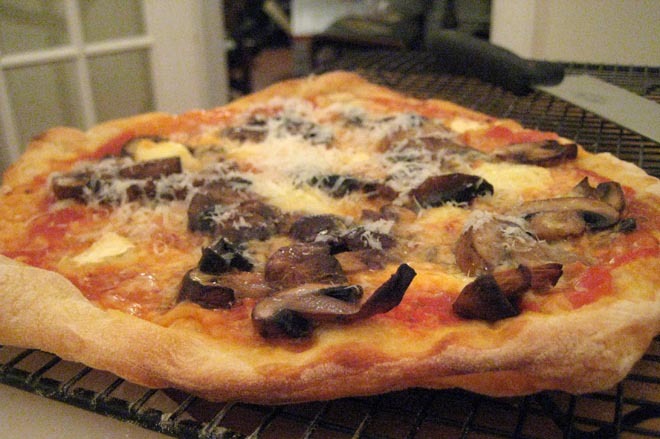 This entry was posted by Tom on Sunday, February 1st, 2009 at 10:44 pm and is filed under Pizza. You can subscribe to responses to this entry via RSS.